60 years ago, history recorded the first time when a man exceeded the speed of sound in controlled and level flight. On October 14, 1947, US Air Force Captain Charles “Chuck” Yeager smashed the sound barrier aided by the Bell X-1, the first of many X-planes to come. The Bell -X-1 was a joint US Army Air Force And NACA ( National Advisory Committee for Aeronautics – which later became NASA ) supersonic research project. At age 24, Captain Charles “Chuck Yeager, a WWII veteran and test pilot at the Muroc Air Field ( now Edwards Air Base ) broke the sound barrier with his X-1. 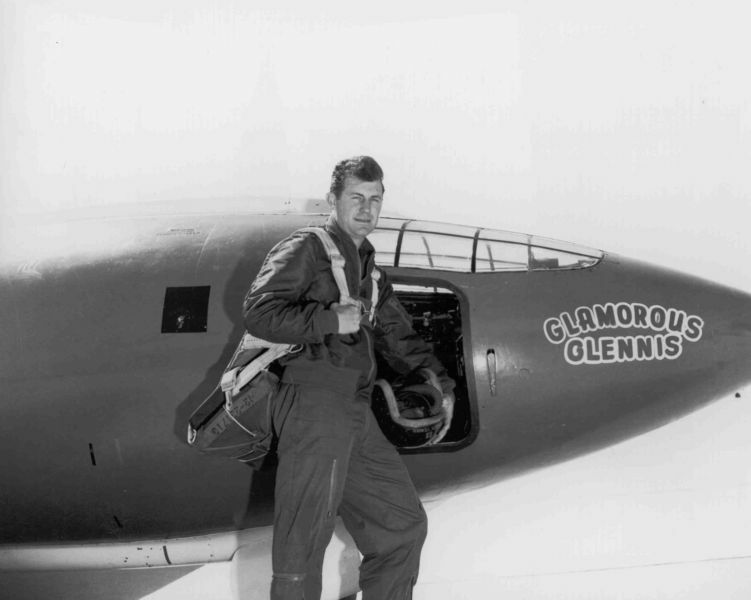 He named his aircraft “Glamorous Glennis” after his wife Glennis Faye Dickhouse. The rocket-powered “bullet with wings” was launched from the belly of a modified B-29 Bomber. Yeager reached a top-speed of Mach 1.06 at an altitude of 45,000 feet (13,700 m). It was flight number 50 for the Bell X-1, a flight that was to make Yeager famous. Two nights before the scheduled date for the flight, he broke two ribs while riding a horse. He was so afraid of being removed from the mission that he went to a veterinarian in a nearby town for treatment and told only his wife, as well as friend and fellow project pilot Jack Ridley about it. The 1948 Collier Trophy was awarded by President Truman to Larry Bell for Bell Aircraft, John Stack for the NACA contributions and Captain Yeager for piloting the flights. Glenys _GAY_ _DICKHOUSE_? He married a man! But really, without the British input on moving tailplanes and their abandonment of their own experiments the US never would have made it. Indeed. The British had the Miles M.52 project that had a number of advanced features including the very thin wings and “all-moving tail”. Under the 1944 agreement between the Air Ministry and the US, both sides were to exchange high-speed data and research. The Bell Aircraft company was given all of the drawings and research on the M.52, but the US reneged on the agreement and no data was forthcoming in return. There are rumors that British politicians were bribed to cancel the M.52.